College Farm Bed & Breakfast01473 652253 work FarmhouseCome and relax at our peaceful 500-year-old beamed Tudor farmhouse on an arable farm near Ipswich (6 miles). The house has been carefully modernised over the years to make a comfortable family home. 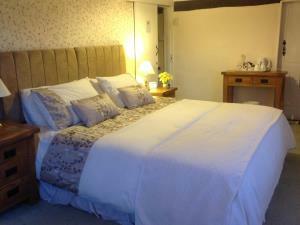 We offer 2 double or twin ensuite bedrooms, 1 of which is in a ground-floor converted stable. Both rooms are comfortably furnished and we have added extras such as toiletries, fresh flowers, hot drinks tray and magazines. There are flat-screen TVs and Wi-Fi in the bedrooms. You can enjoy an award-winning farmhouse breakfast freshly cooked on the Aga to set you up for the day before exploring this part of South Suffolk. Good food is available at the local pub for your evening meal (1/2 mile) with other good places to eat within 5 miles. 4 Stars Silver and Breakfast Award winning Bed & Breakfast. In the village is an 18-hole golf course and also riding and fishing nearby, with walks around the farm. We are conveniently placed to visit 'Constable Country', the Wool Towns of Lavenham and Hadleigh, Sutton Hoo Anglo-Saxon Burial Ship Site (NT) near Woodbridge, and Suffolk's Heritage Coast. Cambridge and Norwich are 1 hour away with London just 70 minutes by train. College Farm Bed & Breakfast limits bookings to 2 or more days. Single occupancy is £60.00 per night. The Oak Room limits bookings to 2 or more days. Stable conversion in the garden separate from the farmhouse. This is a large room with twin beds which can be made into a superking bed if preferred. En-suite shower and toilet. Door leads out to patio and on to the garden. Level access so this room is suitable for elderly guests who cannot climb stairs easily. Freeview TV, Wi-Fi access, USB charge point, hot drinks tray, fridge, alarm clock, comfy chairs to relax in plus other added luxuries. The Stable Room limits bookings to 2 or more days. Hintlesham Golf Course (18 holes) 5 minutes away. Horse riding/hacking 10 minutes away. Country walks around the farm. . Spa treatments/hot tub/gym at Hintlesham Hall Hotel 5 minutes away. Children welcome from age 12. At A12/ A14 interchange (Ipswich West, Junction 55 on A14) go towards Ipswich on the A1214, passing 'Toys R Us' and the Tesco roundabout. At the next set of traffic lights with 'The Holiday Inn' on the left-hand corner, turn left on the A1071 Hadleigh Road. Go 3 and a half miles to Hintlesham, then carry on right through the village keeping on the A1071. The farm drive is half a mile further on towards Hadleigh on the left at a sharp right-handed bend, well sign-posted. From Ipswich Station - 6 miles. Bus to Hadleigh stops in village 0.5miles away. Or taxi service from station. Ideally need a car for easy access.